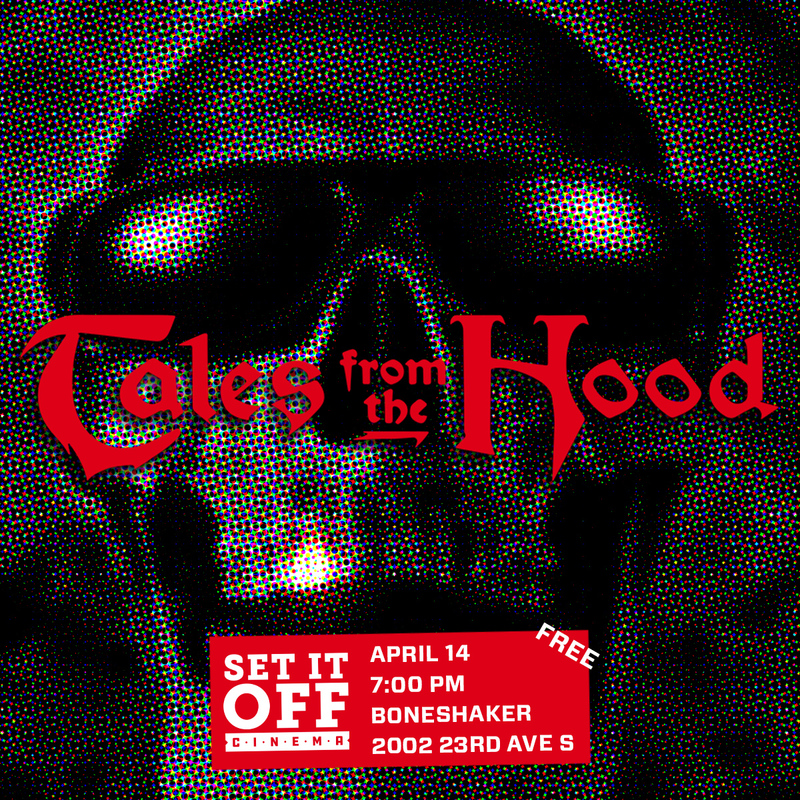 As rental scooters are poised to re-emerge on the thawed streets of Minneapolis, this call aims to encourage the disruption and subversion of their reintroduction to our city. Rental scooters are coming back to the Twin Cities. There was little doubt that this was the case, but in the beginning of March the city of Minneapolis confirmed that as winter fades our streets will soon be littered with scooters once more. There will be more than triple the amount as last year, and featuring even more brands than before. Why does this matter? Because these scooters are a hyper-visible manifestation of the high tech Silicon Valley-ization of daily life. These tech start-ups are reshaping what it means to move around the city with simply a few clicks on an app—smuggled right under our noses with claims of eco-friendliness. Rental scooters are emblematic of a way of living in which every aspect of our lives is made into data. This data is then tracked, studied and used to make algorithms with the intention of not only predicting but also producing normative behavior. However, their visibility is also a vulnerability. They are easily accessible all over our streets, which means the opportunity to sabotage them is equally accessible. Because of this, the scooters have the potential to spread disruptive practices. While these scooters intend to shape particular ways of living, the ease of their destruction in fact allows for the subversion of this goal. • The simplest tactic has also been the most prevalent—knocking the scooters over. This very likely has no effect on the scooter’s functioning, but still makes one’s discontent clear. Because it does not actually damage the scooter, there is almost no risk in doing this. • Covering up the QR code required to activate the scooter is a quick way to put the scooter out of use temporarily. There are countless ways to cover the QR code, like using markers or stickers. If you really want to go all out, you can also decorate the rest of the scooter too. 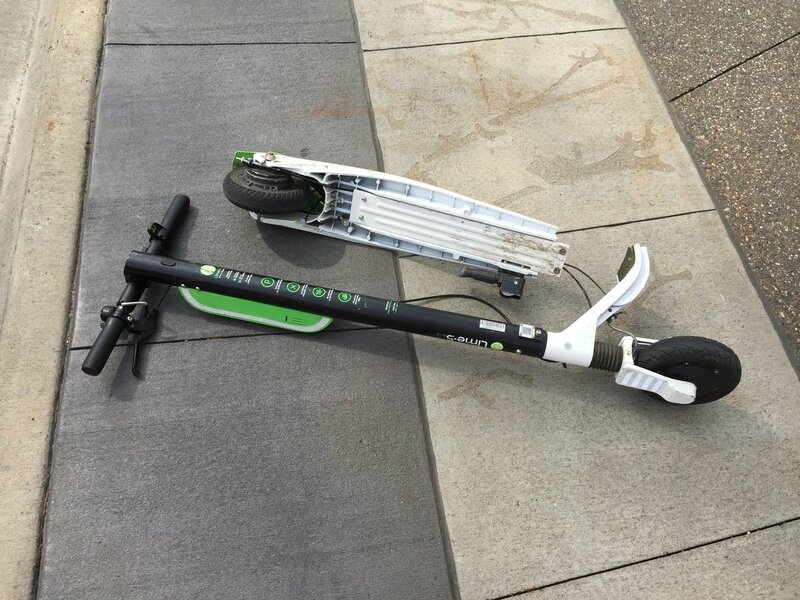 • To really put a scooter out of commission, you have to do some damage. Throwing it off of a ledge, snapping it on the ground, cutting the wires, or running it over with a car. People have gone so far as to set them on fire. Whatever it takes to make the scooter unrideable without professional repair. 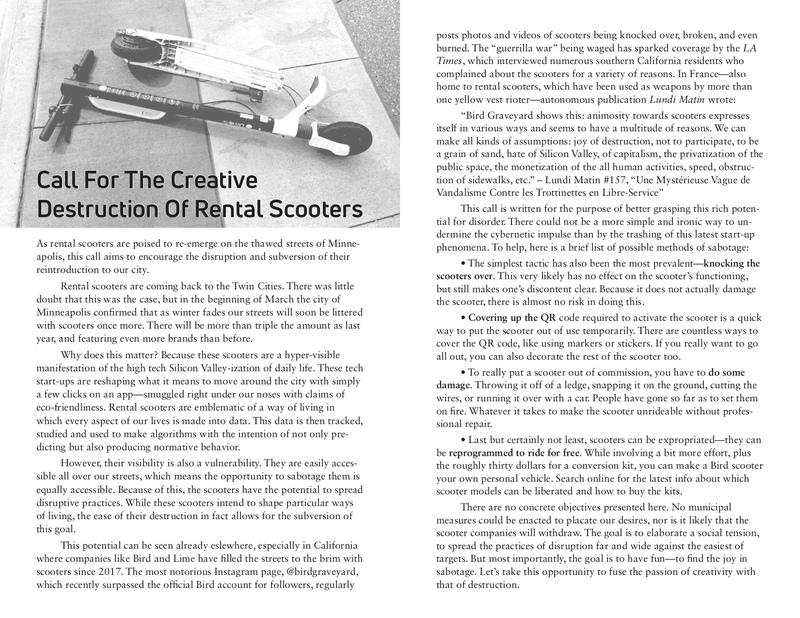 • Last but certainly not least, scooters can be expropriated—they can be reprogrammed to ride for free. While involving a bit more effort, plus the roughly thirty dollars for a conversion kit, you can make a Bird scooter your own personal vehicle. Search online for the latest info about which scooter models can be liberated and how to buy the kits. There are no concrete objectives presented here. No municipal measures could be enacted to placate our desires, nor is it likely that the scooter companies will withdraw. The goal is to elaborate a social tension, to spread the practices of disruption far and wide against the easiest of targets. But most importantly, the goal is to have fun—to find the joy in sabotage. Let’s take this opportunity to fuse the passion of creativity with that of destruction. 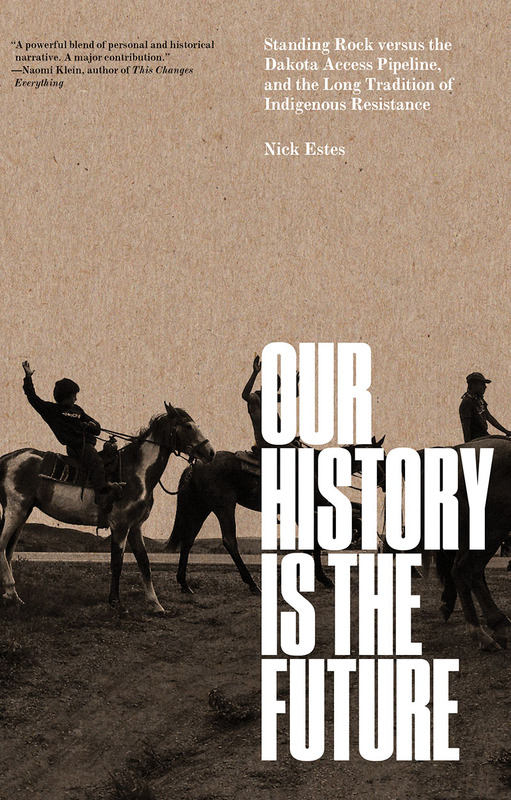 Join us on Wednesday, May 22nd from 6-8pm for a discussion of Nick Estes’ Our History is the Future: Standing Rock versus the Dakota Access Pipeline, and the Long History of Indigenous Resistance. With the climate crisis upon us, stopping Line 3 (a proposed tar sands pipeline expansion) from crossing Minnesota is critical. Our History is the Future will provide important context about organizing and activism from Standing Rock, and help us think about how to frame Line 3 in the long history of settler-colonialism in the United States. Copies of the book are available at Boneshaker for 20% off the cover price. 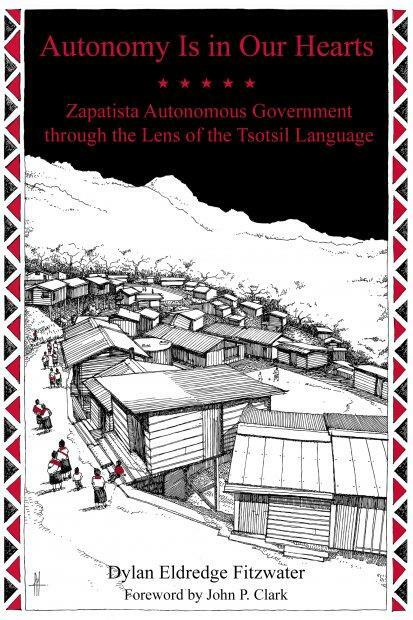 See Estes discuss the book on Democracy Now!, and hear him discuss the current fight for indigenous liberation on the podcast Better Off Red. 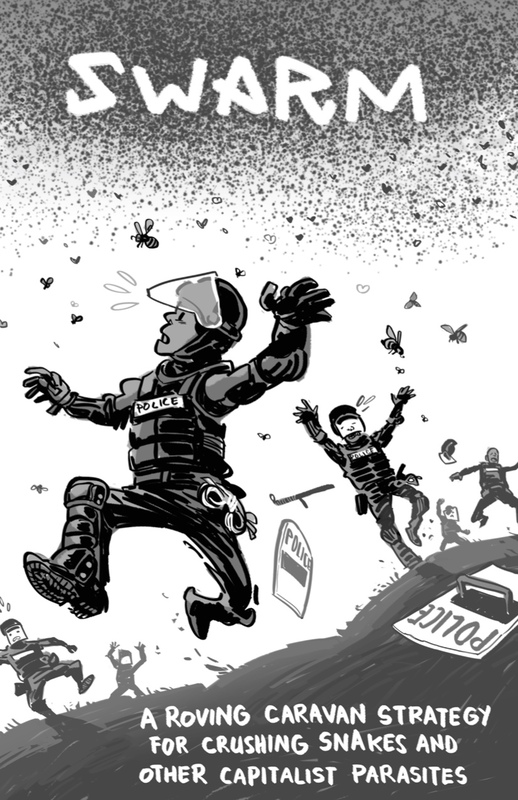 The tales are a horror anthology focused on racialized life—the daily monstrosity of the police and racism. The phrase “direct action” is fairly ubiquitous amongst the radical left, anarchist or other anti-authoritarian milieus. To summarize for those who might not be familiar, direct action refers to acts that directly accomplish their goals. It is often used to illustrate the contrast with electoral organizing and other tactics most often associated with liberal tendencies. 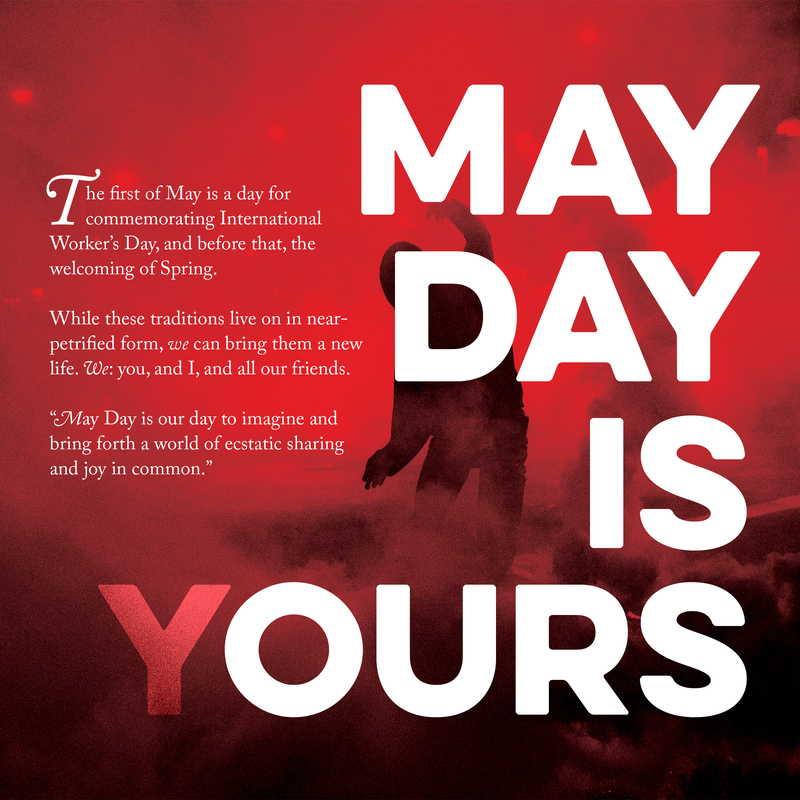 According to the phrase’s wikipedia page, the origins of the phrase itself can be traced back to the early 20th century anarchist movement in the United States, and later taken up by civil rights groups and environmental activists, among others. Since its inception, “direct action” has been used to describe an ever-expanding multitude of activities. Now in 2019, it is clear that the use of the phrase “direct action” has become diluted significantly, which I will examine below. However, I will not reference any specific actions or their communiques because I have no intention to disparage them. In the midst of our miserable hellworld, anyone who takes action against it is a source of inspiration. The purpose of this essay is instead to contribute to a more precise discussion of strategy around what are called direct actions. The first instance of this dilution I will examine is how it is often used to describe actions that are simply illegal or clandestine. This could be spray painting graffiti slogans around a neighborhood, a particularly daring banner drop, or certain blockades. Often these are simply tactics that happen to be illegal but are used to raise awareness of something rather than have a direct impact itself. Occasionally, the logic used here is that the goal of the action was to raise awareness and therefore the action accomplished that goal directly, though it seems evident that this is a clear divergence from the phrase’s original meaning, as the legality of an action can’t measure its how effective it is. The most egregious use of “direct action” has been in reference to essentially the opposite of its intended purpose—literally voting. It’s less common, but especially referendums or ballot propositions are occasionally snuck into definitions of direct action because of the way they don’t rely as directly on politicians. This hollows out the phrase of its content and essentially leaves it meaningless—there is nothing direct about voting for change, regardless of whether we cast the votes ourselves. More often, “direct action” is used to describe actions of a significantly militant magnitude. Arson, bombings, essentially all forms of targeted sabotage. The idea is that the attack on an enemy target disrupts that target’s capacity to operate in some way—this logic appears sound. However, upon further examination there are still some discrepancies. In many cases, these acts of sabotage, no matter how intense, are predicated on one or several demands. Whether the demands are of whatever entity is being targeted or not, oftentimes these attacks either explicitly or implicitly demand that a repressive measure be rescinded, or a company divests from a project, etc. It gets harder to decipher when the demand is implicit—an attack that intervenes during a moment of social tension might not make demands, but takes place in a context where demands are present. With regards to a demand, the attack itself doesn’t directly accomplish the goal, although it puts pressure on the target to concede to the demand in ways petitions never could. Lastly, mutual aid activities are considered “direct action,” for example food shares, or clothing swaps. In a sense, these are ways of directly taking action against hunger, poverty, and similar conditions. But perhaps a more accurate reading would be that these actions temporarily alleviate the symptoms of these conditions for the participants, but don’t necessarily impact how pervasive those conditions are. Here is where I will make a slight shift in direction. I’ve addressed above the ways in which “direct action” has been diluted into a nearly meaningless term. But instead of attempting to reclaim it, what I wish to argue is that “direct action” is a fundamentally unstrategic term for analyzing action. That is not to say “direct action is unstrategic,” only that the question of how direct an action is is fundamentally separate from how strategic an action is. To trace a hypothetical example: overnight, some saboteurs slash the tires of some police cruisers in their city. This directly impacts the ability of the police to patrol the neighborhood and carry out their duties. While the impact of a few tires might be minimal, this is still a direct impact on the functionality of the police. But what really makes an action like this valuable is not adequately described by “direct action.” Hindering the police’s ability to operate opens space for further un-policed activity—although of course this opening will be as minimal as the original attack itself. Regardless, it’s not about whether or not one uses the phrase “direct action” or not, but about the strategic considerations made around the action. So for the purpose of this essay, let’s drop the confusing terminology and take a fresh look at what makes an action strategically valuable. I’ve identified four helpful components to consider, although there are always more. All four don’t necessarily need to apply simultaneously. First, most simply, is for an action to give strength to friends and comrades elsewhere, symbolic or material. Second, a small action should serve as a kind of practice for acting on a larger scale. Third, is for an action to create what have been called elsewhere “signals of disorder.” Fourth, is the consideration of how an action could resonate with other potential comrades and partisans beyond itself. When one takes action to express solidarity with others, the key is simply communicating the message to them. It would be natural to get more excited to see others take bolder or riskier actions to express their solidarity with you, but that aspect shouldn’t be a measure of what is or isn’t important. Rather, the value is in forging a sense of connection with others, across neighborhoods, regions, and continents. For example, getting out of jail to news that someone had dropped a banner calling for your release. Especially in the face of isolation, gestures like these can have a real impact. When one takes action with a crew or affinity group, they are building trust with one another. They are also developing the skills to work together in what can be stressful situations. Whether it is learning to communicate together or how to operate the tools at hand, these are skills we should always be honing. Even acting alone can provide plenty of helpful experience. These skills and relationships will most certainly put us in a better position to act within larger moments of rupture. Schwarz goes on to say “[s]ignals of disorder are contagious. They attract people who also want to be able to touch and alter their world rather than just passing through it. They are easy to replicate and at times, generally beyond our control or prediction, they spread far beyond our circles.” What Schwarz is describing here is the process of resonance. When someone witnesses the aftermath of an action before it’s been swept away from view, or hears of an action later, the action can resonate with them, it can inspire them to act as well. While they are correct about such matters being impossible to predict, we can cultivate an intuition for sensing explosive social tensions. It is far more likely that an action that broaches these tensions will resonate far beyond the original scope of the action. It can also help when an action is simple to replicate, with materials that are easily accessible, allowing others to not only do it for themselves, but to see themselves as capable of doing it. More than just avoiding specialized tools, this means refusing to enforce a subjective border between actor and spectator. If something is seen as belonging to a certain subculture or identity, others will have a much harder time relating to it in a meaningful way. The process of resonance is never linear, and will not necessarily involve the direct replication of action. When an act resonates, it can give birth to unexpected and even insurrectionary events. With practice, through creating these signals of disorder and the cultivation of these sensibilities, we grow our power. We become more confident and bold in acting, creating a more favorable terrain for us to act within. This is the construction of our collective capacity, piece by piece. For this, the framework of “direct action” reveals itself to be an inadequate tool for the task. Examining how “direct” an action is can never measure the potential contained within it. Like all inadequate tools, let’s drop it in search of better ones. 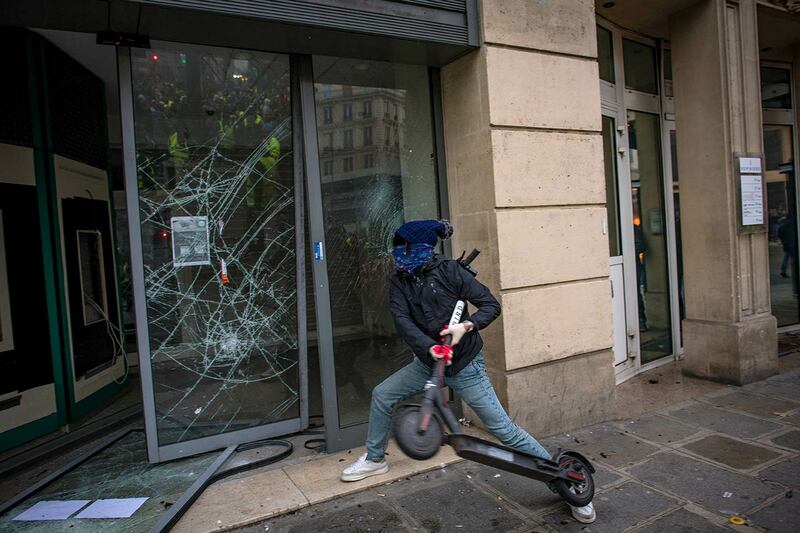 Since November, a massive uprising of the gilets jaunes, or ‘yellow vests’ has sustained itself across France. Initially sparked by a tax on gasoline, hundreds of thousands of people have rioted in city centers, blocked infrastructure, and occupied roundabouts. 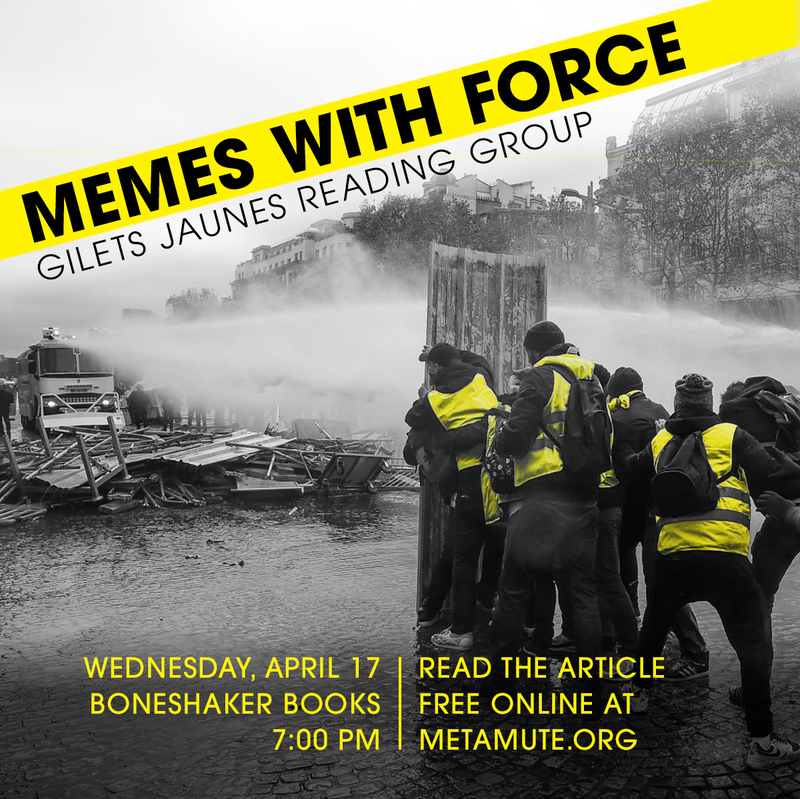 Emerging outside the traditional political institutions, the yellow vests have broken the rules of social movements as we know them and point to a new horizon of revolution. A similar sequence is bound to arrive on this side of the Atlantic—what can we learn from the yellow vests to better act within it? What could it look like to come together across a diverse array of identities? And how have the yellow vests dealt with xenophobia and far right influences? We’re excited to announce that Ende Gelände will be stopping in Minneapolis, MN on their U.S. tour, taking place this February through April, to share stories from Germany’s wildly successful mass mobilizations. Come join German activists from Ende Gelände on their US tour as they share stories from organizing successful mass climate justice mobilizations — including their 6,000 person direct action against enormous open-cast lignite coal mines. 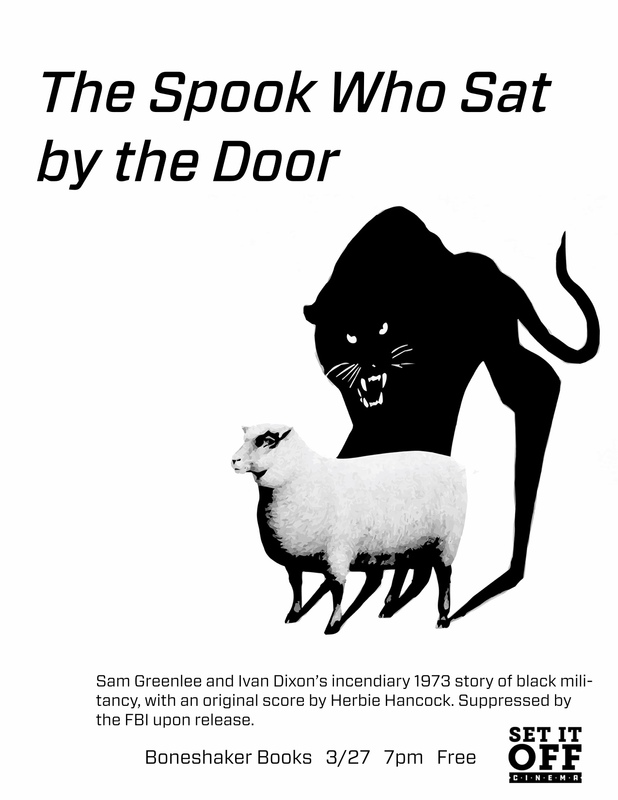 Sam Greenlee and Ivan Dixon’s incendiary 1973 story of black militancy, with an original score by Herbie Hancock. Suppressed by the FBI upon release. 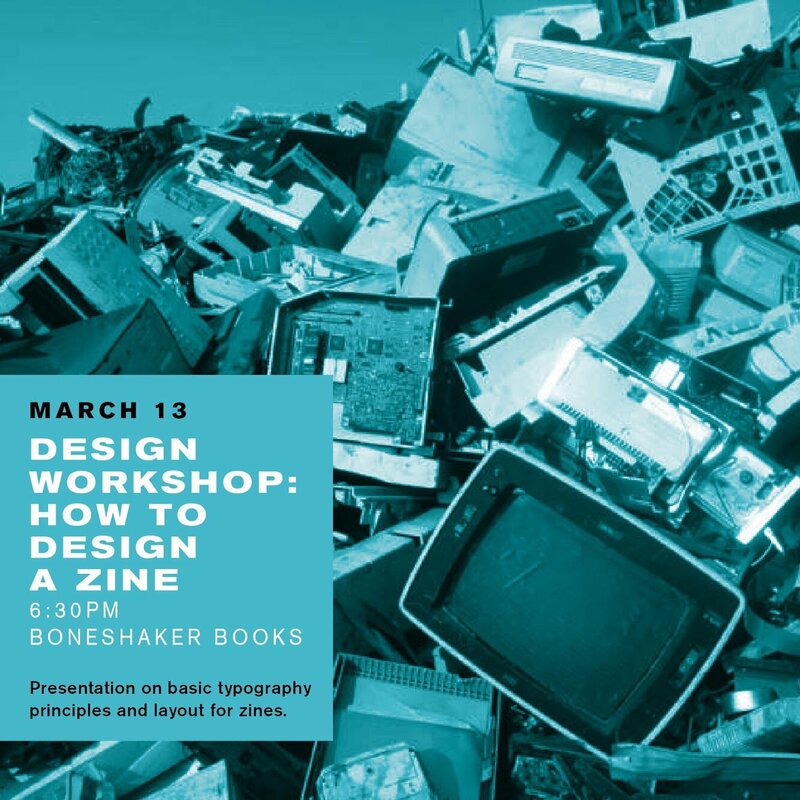 Presentation on basic typography principles and layout for zines/pamphlets. This will be focused on the basics of using Adobe InDesign, but will also go over fundamentals that are generally applicable. Attendees are encouraged to bring projects they are working on to share and recieve feedback for improvement. On Sunday, February 17th a small group of right wing protesters rallied in downtown Minneapolis to protest Ilhan Omar over her controversial remarks. Naturally, their protest only gathered a handful of participants and took place in front of the wrong office building. Their protest was a total failure, their march cancelled, and one of their cars ended up with a smashed window, all while instigating internal divisions. While this is a clear victory for those of us who consider ourselves revolutionaries, it seems as if it, like many others against the right in Minnesota, have occurred through luck rather than strategic intelligence. This occasion offers us the chance to reflect on the shifting political terrain, and have inspired the following brief notes. The ideas are still scattered, being just a single part of a conversation involving a multiplicity of perspectives. If Donald Trump could be said to have accomplished one thing, it would most certainly be the blow dealt to the U.S. government’s legitimacy, perhaps the hardest seen in recent history. With his election, millions of people took to the streets to voice their refusal. The day of his inauguration we were plunged into a world of mass protest, scandal, and above all, uncertainty. Scrambling to pick up the pieces, Democrats have been split between on the one hand desperately clinging to civil order, and on the other appealing to the disillusioned through left-leaning politicians that claim to be the true face of resistance. And while they have ruffled some feathers amongst the older generations, the ruse succeeds in transforming the terrain of resistance into the political system, instead of where it needs to be: our lives. In this sense, much of the momentum that arose in the last two years has been folded into the Mueller investigation and the valorization of various liberal politicians like Nancy Pelosi, Alexandria Ocasio-Cortez, or in this case, Ilhan Omar. Opposition towards the Trump regime has often carried along with it a defense of the neoliberal order before it was tampered with by the far right—or, for the more conspiratorially-minded, Russia. On the one hand, this offers revolutionaries a wide array of short-term tactical alliances in opposing the current state of affairs. But if we lose sight of the long-term goals, we’re setting ourselves up for inevitable failure. What we mean is that the struggles against the far right, our democracy’s authoritarian tendencies, and building a better society are not separate. There is only one trajectory: that of building, step by step, an autonomous material force that can carve out space for other ways of living, short circuit the mechanisms of oppression, and destitute the forces of order—whether it’s the bigots attempting to rally or the cops themselves. Anti-fascism is often presented as a duty, as a moral obligation to deny the far right access to a platform. But we know how ineffective and disempowering it can be to show up to a rally with such a small turnout that you could count it on your hand. Likewise, we have given up the stale practice of rallying on the weekend in the empty downtowns or capitol buildings. The importance of these actions by the right shouldn’t be overestimated. This is not an argument to let right wing rallies occur unbothered, but to open the question of confrontation to allow for a more strategic dimension. If our energy is depleted reacting to the endless activities of the far right, it doesn’t matter who wins each physical conflict. In building a material force we learn to play to our strengths—we find methods of engagement that increase our capacity to act rather than diminish it. And, just as importantly, we can learn to let go of the sense of obligation to respond every time a right wing event is announced. Enjoying the company of friends as we waited in so-called “Little Mogadishu” to pounce on right wing activists who would never arrive, we felt powerful. We had come together from so many different walks of life, ready to act collectively if the situation called for it. It hadn’t required an outpouring of resources to watch the right’s plans dissipate in front of their eyes, and risks were kept to a minimum. We intend to build on this success rather than let it fade to memory. The Uses of Disaster by Out Of The Woods. Climate change is here. 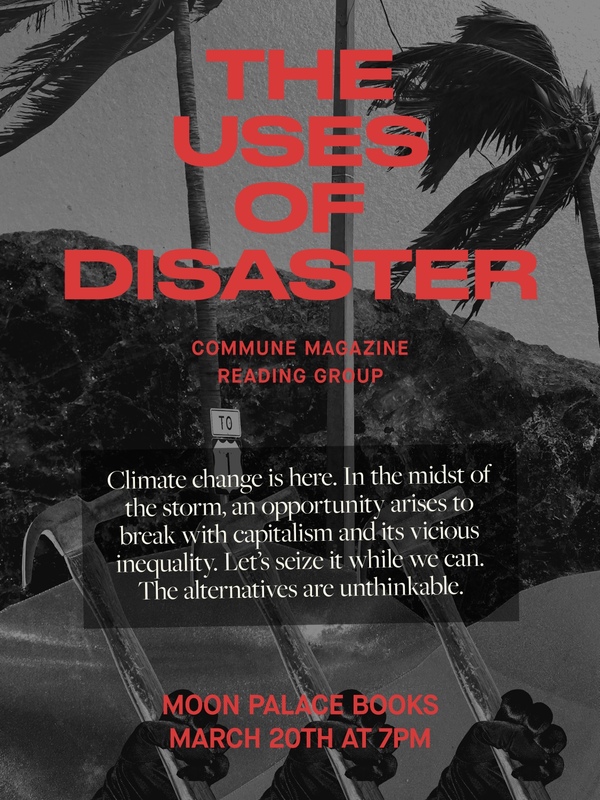 In the midst of the storm, an opportunity arises to break with capitalism and its vicious inequality. Let’s seize it while we can. The alternatives are unthinkable. The article can be read for free here. It is with many mixed feelings that I write to inform folks that I am withdrawing from supporting Cameron Crowley, charged with being the hacker “Vigilance”. Cameron is moving forward with a cooperating plea deal. While I have no reason to believe it will involve cooperating against groups or individuals involved in social justice movements, it is nonetheless at odds with the transparent resistance to collaboration necessary to our movements. While I am saddened, it is important to note that I reached out to Cameron to offer support after he was charged. He had little to no previous relationship to social justice movements. Cameron’s family and close friends will likely continue to support him and it is my hope that he will have as easy a time as possible while causing no harm for others. I continue to dream of a day when the secret and coercive tools of state violence are no longer a threat and when people who act up to push back against racism and other institutionalized oppression are held up as heros instead of being knocked down and punished. And so we struggle on.